These stylish horseshoe cable hand warmers are super-simple to knit. These hand warmers are basically nothing but a larger version of a horseshoe cable swatch. 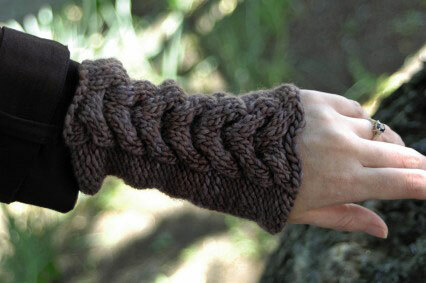 Gauge: Not crucial to this project; approximately 4 stitches and 5 to 6 rows per 1 inch with yarn shown in the image. Rows 1 and 3 (RS): P12, k12, p12. Rows 2, 4, and 6: K12, p12, k12. Row 5: P12, sl next 3 sts to cn and hold in back, k3, k3 from cn, sl next 3 sts to cn and hold in front, k3, k3 from cn, p12. Repeat Rows 1–6 until the hand warmers are long enough to cover the space between the base of your thumb and 1 to 2 inches past your wrist bone. You can make them even longer if you want. Seam the right and left side of the piece together and try it on. Repeat the pattern for a second hand warmer.